Posted on October 31, 2016 by Smorgasbord - Variety is the Spice of Life. The actual word asthma comes from the Greek azein meaning to breathe hard. It is an intermittent disease unlike chronic conditions such as cystic fibrosis, chronic bronchitis or emphysema. The bronchial tubes in the lungs are made of muscle and a mucus membrane. 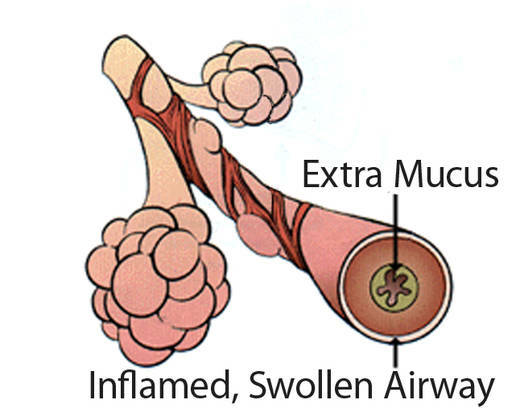 During an asthma attack this mucus membrane becomes inflamed and swollen causing the muscles to contract and create spasms. Air movement is restricted and as it tries to escape from the bronchi it causes the wheezing which is the most common symptom of asthma. Attacks vary in severity but they can easily spiral out of control, particularly in young children who are more inclined to panic. If the attack is not controlled either by medication or relaxation techniques there is a danger that the airways will close completely cutting off the supply of oxygen to the major organs and the rest of the body. The word syndrome, when associated with a disease, implies that the cause is usually unknown and this is the case with Asthma. Until recently Asthma was divided into two types, allergic (Extrinsic) and non-allergic (Intrinsic). Researchers have now discovered a number of classifications within the two main recognised causes that help isolate possible triggers. Over 90% of asthma sufferers are going to be suffering from allergic asthma and the triggers for this are very widespread. It could be from pets, cigarette smoke, pollen, dust mites, foods and other common pollutants such as chemicals in the workplace. When children suffer from asthma it is considered to be the allergic kind and there is evidence to suggest that boys are more at risk than girls are. There are a number of possible food triggers that might be responsible but there is a definite link between smoking and pregnancy. If the mother smokes the foetus will not have mature lungs at birth. If the mother or other people around the baby continue to smoke the exposure will trigger an asthma attack. This list is not exhaustive but does represent the most common allergens that are likely to trigger an asthma attack. · Additives and preservatives in food such as tartrazine and sulphites. · Tree and grass pollens. If a child seems to suffer from a persistent hacking, or congested cough it might indicate the onset of asthma and it is a very good idea to get them checked by a doctor. A very young baby may suffer from a persistent cough and also have strange muscular contractions between the rib cage when inhaling. A baby might flare at the nostrils when feeding indicating that it is having breathing difficulties. If the baby is breathing more than 40 times per minute when sleeping, then you should mention it to your doctor immediately. Non- Allergic asthma is not likely in children and tends to develop in adults in their 40’s. This may be an accumulative exposure to certain chemicals in the workplace, smoking, perfumes, a tendency towards upper respiratory tract infections or intolerance to cold air. There are some indications that people who suffer from severe indigestion, including reflux, may also be at risk of an asthma attack. If there is a family risk of allergies, including asthma, there is a possibility that strenuous exercise could trigger an attack. A combination of increased breathing rate with a loss of heat and moisture in the lungs can cause coughing throughout the exercise. In cold and dry weather the symptoms may develop into a full-blown asthma attack. When is an attack likely to take place? An attack can take place at any time but it is very common at night and for some reason the most likely time is between midnight and 4 am. There are a number of possible causes such as mites and dry skin cells in the bedclothes and also sleeping position and fluctuations in bedroom temperature. Being night-time only serves to make the attack even more frightening than normal, particularly for children, or if it is the first attack the sufferer has experienced. It is very important to prevent the early symptoms from escalating into a full-blown asthma attack and it is just as vital for family and friends to understand and recognise the initial signs so that they can support and help the victim. The most common signs are a dry persistent cough with breathlessness followed by a tight feeling in the chest. As I have already mentioned, wheezing is very likely, as are signs of a panic attack. The victim is likely to become very agitated with sweating and increased pulse rate. The natural instinct is to rid the airways of the inflamed mucus and coughing is the body’s way of achieving this. As the attack progresses to an acute stage there will be evidence of lack of oxygen by way of a bluish tint around the lips, face, gums and nail beds. It is vital that medical assistance is called immediately. How can you help someone who is suffering an asthma attack? It is very important that you keep calm. The ability to breath is fundamental and when that is restricted it is extremely hard not to panic and you will need to help them keep focused until medical assistance reaches you. A person who has been asthmatic most of their lives will have an inhaler and will be practised in dealing with the situation while waiting for help but there will be occasions when an attack happens unexpectedly or for the first time and in that case you will need to be active to ensure their best chances of recovery. As with a heart attack the sitting position is the best for the person to adopt, probably upright on the edge of a bed or sofa with something to lean on in front of them. Keep reassuring them and try to get them to breathe deeply and evenly with you and this is easier if you are in front of them and they are focused on your mouth and eyes. Pursed lip breathing is used by both asthmatics and athletes to expel the build-up of carbon dioxide in the restricted airways. They need to inhale as normal through the nose and then exhale by “blowing” out the air quite vigorously. This stretches the bronchial tubes and helps get rid of the excess carbon dioxide. Keep reassuring them that everything will be fine and that help is on the way. How can an attack be prevented? In this modern world it is virtually impossible to remove all the possible triggers from an individual’s environment. You can take steps in the home to remove potential culprits although if you love your cat or dog it is certainly not easy. With pets you need to minimise the areas that their dander and mites can gather such as carpets and soft furnishings. Marble or wood floors are a great deal more hygienic than carpeting, especially in the bedroom. Don’t allow pets on the furniture or beds and always make sure that hands are washed after handling them. If there are rugs in the house then they need to be vacuumed every day. The same goes for sofas and chairs. Bedding needs special attention and pillows and duvets should contain man-made fillings not feathers. Change linen as frequently as possible and make sure that it is washed at 55°C (130°F) to kill any dust mites and remove allergens. Use organic washing powders to reduce the risk of a reaction. For children it is not only the family pet that might cause a reaction. Stuffed toys can also be well loved and handled. Stick teddy in the freezer for 24 hours every few days and this will kill off dust mites. Change a child’s bed linen every day as well as pyjamas. What about food triggers for asthma? As I have already mentioned there are certain additives and preservatives that could trigger an asthma attack. There are also certain foods that can cause a reaction and these are milk, eggs, peanuts, tree nuts, soy products, wheat, fish and shellfish. Experts believe that relatively few asthmatics are actually affected by these food triggers but they are known allergens, that can cause anaphylactic shock in some people, so should be suspect. There has been some research into the effect of casein, which is a milk protein and a known allergen on the increasing rates of asthma in children, particularly those in deprived areas. The premise is that children in these areas are given a great deal of milk and cheese through welfare agencies and as a result asthma rates have increased significantly in relation to children in other environments. It has been proved in other studies that eating dairy products increases the levels of mucus and as it is the inflammation of the mucus in the bronchial tubes that results in asthma attacks, it makes sense to consider dairy products as a major suspect food. In addition to foods that we eat naturally in our diet, there are also hidden dangers in processed foods and if you are are a regular visitor you will know that I prefer the ‘Cook From Scratch’ method of all food preparation. As you know, I rarely advocate eliminating any food permanently but in the case of life-threatening allergic food reactions, there are some compelling reasons for not eating foods that you strongly suspect of triggering an asthma attack. If you eliminate the suspect foods that I mentioned completely, for at least six weeks and then re-introduce them, in a very diluted form, you will be able to determine if there is any reaction. There are also a number of allergy testing services available – but make sure that they are reputable and that any elimination of foods is carefully monitored and the effects measured from week to week. Is there anything else that will decrease the risk of asthma attacks? It is very important to maintain a healthy immune system. The last thing an asthmatic needs is to suffer from frequent infections, particularly of the upper respiratory tract. Colds and bronchitis are potentially very damaging to the already weakened respiratory system so a diet high in fresh fruit and vegetables is essential. Exercise is also very important, especially walking, which is unlikely to trigger an exercise related attack unless the air is very cold. If you are exercising outside in the winter it is important to wear a scarf around your lower face to ensure that air is warmed before entering the nasal passages and airways. Lifting weights under supervision will help develop the muscles in the thorax and help control breathing more effectively. Relaxation is another key factor, especially at the onset of an attack, and many sufferers find that yoga techniques help them relieve the stress and prevent the attack from escalating. This entry was posted in It is a Wonderful Life. and tagged Allergens, asthma, Extrinsic Asthma, Intrinsic Asthma, The Lungs by Smorgasbord - Variety is the Spice of Life.. Bookmark the permalink. Asthma was the ruler in this house when both my children were young. When an attack was imminent I learnt that focus on them was essential, relaxation was the key ( we used to play a game of blowing balloons high into the air, – to distract) but a real help was getting him to drink a hot drink, as hot as he could tolerate it, also warmth near his chest helped a lot. My daughter was sensitive to dust etc so not a true asthmatic and her condition was easily controlled but my son, was allergic to everything you could think of – however, he is now 28 a crossfit gym owner and personal trainer proving there is always light at the end of the tunnel. My nephew was bad when a youngster. Now married and 40, he seems to have grown out of if between then and now. I don’t see him often. Thank you, Sally for a wonderfully informative post. I have suffered from asthma on and off since childhood. I see a wonderful asthma nurse who has got my symptoms under control. I was interested to read about yoga in your post and I think I will give this a try. Reblogged this on Teachezwell Blog.